This is the perfect starter set! 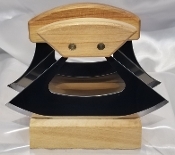 Ideal for Newlyweds, House warming or just because you always wanted an Ulu and can't decide which one to get. This Set includes: 1 Birch Umialik Ulu of your choice, 1 Birch Inupiat Ulu of your choice and a 2 slot storage stand for display and easy access all the time. See our accessories section for leather sheaths to store safely in a drawer as well. Happy Chopping!! *Engraving will be on Umialik Ulu unless otherwise stated in special instructions.